Please note: Trespassing Time is out of print, but you can purchase copies direct from several of the authors. Please use the contact form if you are interested, thank you! On the lonely trails of the windswept plains, desperate spirits wander across time burdened with the raw emotion of their unsettled lives. Does the fog creeping up from the river bring vengeful ghosts seeking to settle an old score? Are the fleeting shadows you see from the corner of your eye leading you to the horrors of the restless dead? These sixteen compelling and spooky stories of love, legends and evil will challenge your sense of reality. Is the deserted church really the Gates of Hell? Can a murdered cat save a young woman’s life? Will the friendship of two small children surmount even death? How far will a long-dead mother go to get back a precious charm bracelet? What is the prairie spirit that demands a terrible price from those who break the sod? From a wind-tossed lake to a lonely abandoned cemetery; from a stone mansion to a barnstormer’s plane, eerie specters await you as you dare to trespass time. 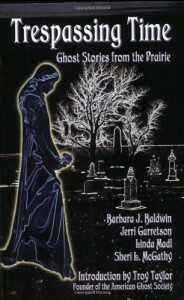 View more books written by the author "Barbara Baldwin". View more books written by the author "Jerri Garretson". View more books written by the author "Linda Madl". View more books written by the author "Sheri L. McGathy". View more books in the genre "Collaborations".